We will break bread together in the good company of friends and neighbors who share our Democratic values, our passion for building a better world and our commitment to social, economic, environmental and racial justice. We will make our voices heard as we come together to celebrate our extraordinary Senator Watters as he is introduced by a special mystery guest who knows him well. We will honor Senator David Watters for his service to our local communities, our proud state and our beloved country. Our Silent Auction, a cash bar, a panoply of appetizers and delicious home-made desserts will enhance the festivities. This will be a fun, FUNdraiser. 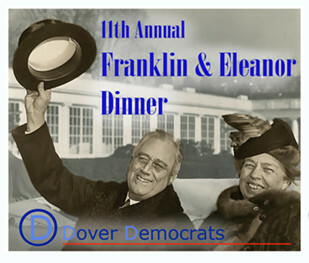 All proceeds from this major annual fundraiser go to support local Democratic candidates and the all-volunteer work of the Dover Democratic Committee in our community. Tickets are $35 in advance, $40 after March 31. Consider a $100 sponsorship – affords one ticket & program listing. Provide major support with a $500 table sponsorship – 8 tickets and program listing.